BMW | What Does BMW Mean? BMW means "Big Mexican Woman" and "Bavarian Motor Works". "Big Mexican Woman". The abbreviation BMW is used with the meaning "Big Mexican Woman" to describe a woman of Latina origin who has a large figure. It is an empowering and politically-correct term for women of South-American origin who might previously have been described as "fat". 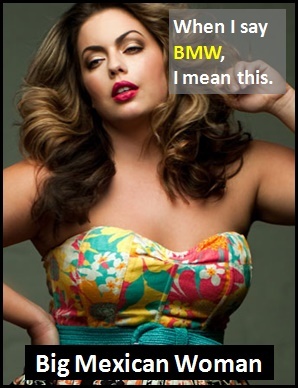 In this context, BMW is typically used as a description on dating sites or as an indexing tag on pornographic websites. "Bavarian Motor Works". BMW also stands for "Bavarian Motor Works" ("Bayerische Motoren Werke" in German), which is a car and motorcycle manufacturer with its headquarters in Munich, Germany. BMW also stands for "Bavarian Motor Works". Did you hear about the dork who kissed a BMW? He burnt his lips on the exhaust pipe. Question: How many elephants can fit inside a BMW? Answer: As many as she can eat. Whether used with the meaning "Big Mexican Woman" or "Bavarian Motor Works", BMW is classified as an initialism abbreviation, as it is pronounced using its individual letters (i.e., "Bee Emm Dblyoo"). Initialisms are different to acronyms, which are spoken like words. BMW cars have always been known as BMWs but, before the digital era, we would probably have just said something like "Big South-American Woman" instead of using the abbreviation BMW with the meaning "Big Mexican Woman" .